I couldn't feel the pegs under my feet anymore! It had to be the end! I was a few feet in the air with the new KX250F beneath me and I'd forgotten to turn my toes in and grab the bike with my knees. All I could think of right then was how I was going to land the front first and go flying over the 'bar and end up with a face full of dirt and a backside full of KX250F. Not the best way to end my short career as a motorcycle journalist. But thankfully, the moment I landed, things worked out the way they usually do. As soon as rubber met dirt, my boots met the serrated pegs and all was well again. On to the berm and over the next jump it was. 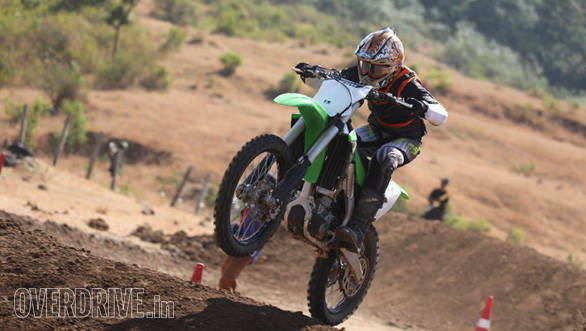 And that in a nutshell is the KX250F. It might be absolute rubbish and also illegal on the road , but the moment you take it out on dirt, it's as desirable as Eva Green. 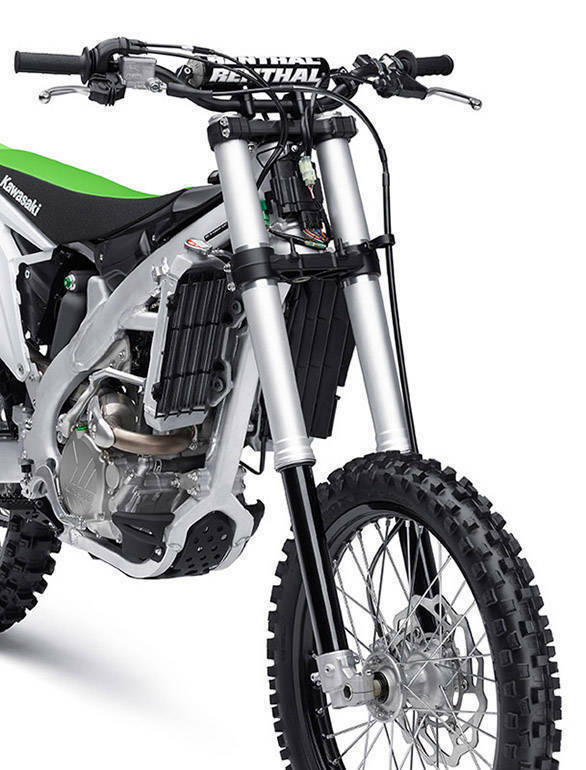 Like all motocross bikes, the KX250F too is built to be able to land ridiculous jumps and absorb even the knarliest of terrain. 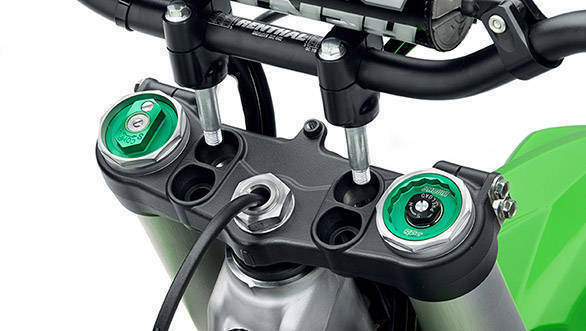 The KX uses a Showa SFF up front and Showa monoshock at the rear, both fully adjustable. Being a competition bike and not a trail bike, the suspension is a bit stiffer than the enduro bikes of the same displacement (Yamaha WR250R, KTM 250 EXC-F). But it isn't painful. The front end doesn't dive under braking and also gives you lots of feedback when going into turns. And while exiting turns and accelerating away, the rear compresses just the right amount to give you traction. The 107kg kerb weight also aids in cornering, making the bike effortless to throw around. An added advantage is that the light weight also aids in keeping rider fatigue to a minimum. Over big jumps, the suspension compresses enough to shield you from impact, but never once feels like it is about to bottom out. And over ruts and whoops, the stock setup, with 310mm of wheel travel, compresses fast enough to transfer minimal impact to the rider and rebounds fast enough to ensure that your wheels are on the ground for squirts of throttle to accelerate and/or stabilise - essential if you want to be setting a blitzing pace through the track. But, like all off-road bikes, the first step is to trust the knobblies. To someone who has been riding mostly on road for the past several years, it is a difficult thing to process. For me, every time I get on a motorcycle with knobblies, it takes a few minutes to reset my mind and assure myself that the tyres will find traction come hell or high water. And after you begin to trust the tyres again, it all starts falling in place. Off the mark, the tyres hook up super-quick and deliver mind-numbing amounts of thrust. The engine delivers power alarmingly fast and the throttle response is so quick that you begin to think that the throttle body is hardwired to your brain. On the straights, you will be shifting through gears super quick to the extent that within a few seconds, you will be sitting in the fifth gear. Off the top of my head, I'd say I've used around two seconds per gear when going flat out. Yes! It's that quick! The numerous turns and short straights in between obstacles means that motocross bikes need to accelerate super quick, which is the reason behind short ratios which trade top speed in favour of acceleration. 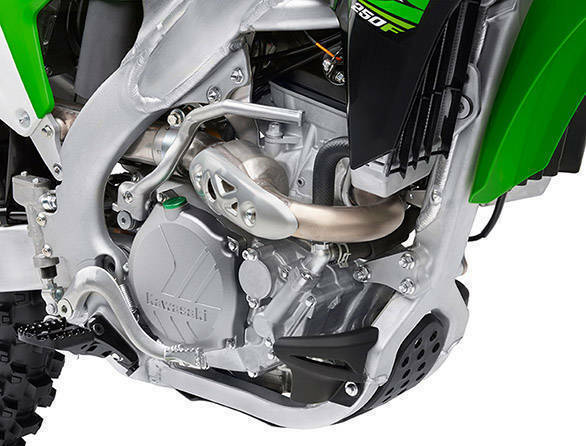 The KX's 249cc motor delivers power in a typically motocross kind of way. The low end is sort of dead while the top end is downright scary. What's great about the KX, though, is that it runs a dual injector setup - one upstream and one downstream. This means that while the top end performance is mind numbing, there is lots of usable power in the mid-range to putter around if you're, like me, tired after a few laps. It also means that the bike won't stall on you if your pace is slow and you're in a higher gear than ideal. But if you're really going flat out, you'll find that everything works beautifully on this motorcycle. The seat is long and flat and lets you weigh either end of the motorcycle easily. The bike itself is narrow enough that you can stretch you leg out in front, close to the forks without the shrouds or radiator getting in the way. The sides are flat enough to let you grip the bike perfectly with your knees and ankles. 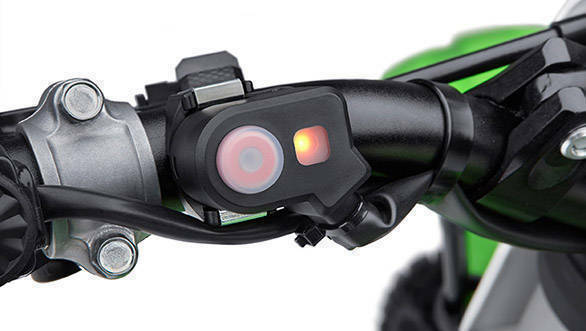 And the handlebars are wide enough to give you just the right amount of leverage without getting in your way. Overall, it seems very close to being perfect, straight off the rack. It is very evident that this motorcycle was meant to be ridden fast. And that is when the motorcycle starts to work the way it is meant to. In fact, the faster you go, the less impact you feel. And the incredible bit is that it manages to isolate you from impacts while still delivering feedback from the front and the back. And when you need to shed speed, the 240mm/210mm combo of front and rear brakes works wonders. 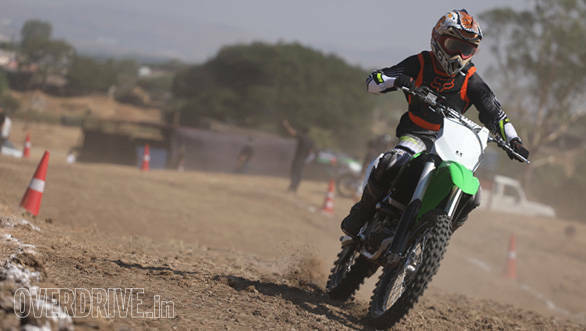 At Rs 7.41 lakh (ex-Delhi), the KX250F is a great deal especially when you consider it is only 26.5 per cent more expensive than it is in the US and you don't have to pay registration and other charges. In our dirtbike starved country it's great. But there are some disclaimers. Mind you, this motorcycle isn't road legal. So if you buy one, you should also find, rent or buy a farm with a MX track or ample trails to play around in and park your KX in when you're done. Or else, you should think about how you're going to get it to where you want to ride it. 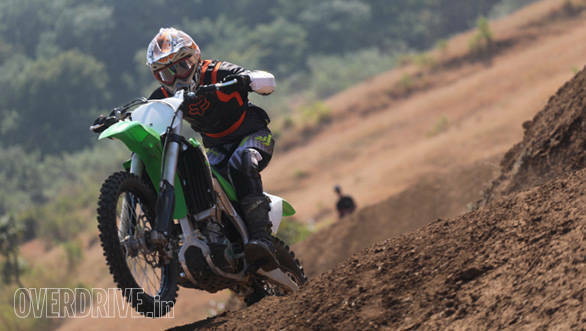 You should also keep in mind that motocross bikes typically have very short engine life-spans. So if you're going to be riding at race pace, expect an overhaul every 30-50 hours or 70-90 hours if you're going to go a bit slower. But if you've got both of these things covered, then there is no reason you shouldn't get yourself one. It's ridiculously fun to ride. It is also fast enough to keep things interesting while staying slow enough to not make you scared of it. I definitely want one!